OBJECTIVES: To describe associations between dietary nutrient intake and progression of sarcopenia, the age-related loss of muscle mass and strength. DESIGN: Prospective cohort study of community-dwelling older adults. SETTING: Southern Tasmania, Australia. PARTICIPANTS: Seven hundred forty noninstitutionalized older adults (50% female; mean age 62� randomly sampled from electoral rolls. MEASUREMENTS: Dietary nutrient intake was examined at baseline and follow-up (2.6�4 years later) using The Cancer Council Victoria's Food Frequency Questionnaire (FFQ). Appendicular lean mass (aLM) was assessed using dual X-ray absorptiometry and muscle strength of the knee extensors using a dynamometer. RESULTS: Failing to meet the recommended dietary intake for protein was associated with significantly lower aLM at baseline (−0.81 kg, 95% confidence interval (CI)=−1.54 to −0.08) and follow-up (−0.79 kg, 95%CI=−1.42 to −0.17). Energy-adjusted protein intake was a positive predictor of change in aLM over 2.6 years (�0.10, P=.003). Energy-adjusted intake of iron (�0.07, P=.02), magnesium (�0.07, P=.02), phosphorus (�0.07, P=.047), and zinc (�0.08, P=.02) were positive predictors of change in aLM, whereas retinol (�−0.09, P=.005) was a negative predictor of change in aLM after adjustment for protein intake. 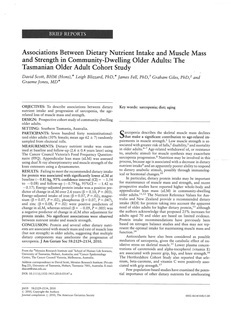 No significant associations were observed between nutrient intake and muscle strength. CONCLUSION: Protein and several other dietary nutrients are associated with muscle mass and rate of muscle loss (but not strength) in older adults, suggesting that multiple dietary components may ameliorate the progression of sarcopenia.